A typical Commonwealth Gravestone. The fallen soldier is said to be Known unto God. Last October, Year 11 students from Castle and Kings were taken to Belgium and Northern France to visit the battlefields and commemorate the casualties of the First World War. This trip has become an annual one for Year 11 History students, which is made all the more poignant by the remembrance of the deaths of Old Berkhamstedians in the Great War: 231 Old Boys, and two Old Girls (serving in Voluntary Age Detachments). After a windy ferry ride across to France we then drove to Belgium. Our first port of call was the museum and cemetery at Hooge, near Ypres, a place of special memory to Britain as this last outpose of Belgium against the Germans was mainly defended by the British, with huge casualties during the four years of the war. In the museum we saw weapons and artefacts from the Great War and in the cemetery we saw our first evidence of the casualties of this conflict. Tyne Cot Cemetery, the largest British war cemetery in the world. We next visited the huge Commonwealth war cemetery at Tyne Cot. 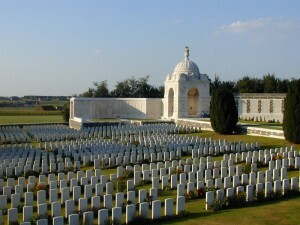 With nearly 12,000 soldiers buried in the cemetery and the names of 35,000 soldiers commemorated who were presumed killed in the Ypres Salient between August 1917 and the end of the First World War, but whose bodies were not found, the students were soon confronted with evidence of the horror of the First World War. They learnt that many of those killed were young men aged between 18 and 25, and that many either had no known burial or were, as so many of the gravestones made clear, the buried remains of unidentified soldiers ‘Known unto God’. The sheer concentration of gravestones helped to bring home the horror of the First World War, a feeling that was reinforced by the presence of some of the German machine gun bunkers that had killed many in the battle between July and November 1917. A link between the School and this battle exists as the Pearkes Sword, annually presented to the most outstanding CCF cadet, was given to the School by George Pearkes, an Old Berkhamstedian who had won the Victoria Cross whilst leading an attack which captured a major enemy outpost outside Passchendaele village. The visit was followed by one to the German war cemetery at Langemarck, a German First World War Cemetery. Here we considered the differences between the British and the French cemetery, with the German cemetery much smaller than Tyne Cot but containing the bodies of 44,292 German soldiers. The names of the dead are marked by small slabs on which are marked the names of groups of soldiers, with three small crosses and the mourning statues at the back of the cemetery completing the impression for many on the trip of the human cost of the First World War. The remains of the German machine gun bunkers at the cemetery also provided a grim parallel with those left at Tyne Cot. The German cemetery at Langemarck. 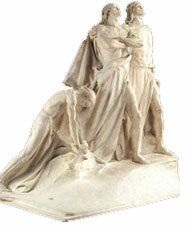 Its design is wholly different from that of Tyne Cot. We arrived at Kemmel (a hamlet just outside Ypres, Belgium) and all the students settled into their accommodation. The hostel just outside Kemmel provides excellent accommodation and after settling into theor rooms the students came upstairs for a talk by Mr Savill on the First World War and the background to the battlefields they were going to visit. The night then ended with some free time and a busy two days ahead. Sunday was a very busy day, with a long drive to the Somme and Arras battlefields of Northern France. We visited the amazing tunnel system and monument at Vimy Ridge, near Arras. First we inspected the huge and impressive memorial at Vimy Ridge to Canada’s war dead, with the statue of the spirit of Canada looking out over the Ridge and encapsulating the grief felt by the Canadian nation for her war dead. We also found the the names of Old Berkhamstedians who died in the First World War whilst serving in the Canadian Army. We then waited for our young Canadian guides (it is an honour to work for as year as a guide at this Canadian memorial) and both groups went down at staggered intervals to visit the tunnels complex which the Canadians amazingly dug beneath the German trenches, completely surprising the Germans when they poured out next to the unprepared German soldiers on 9th April 1917. We learnt that it was also in the First World War that Canadians were supposed to have first thought of themselves as a separate country and as Canadians, with the Maple Leaf symbol having been worn for the first time on the uniforms of the Canadians serving in the First World War. The Vimy Ridge Memorial, designed by Walter Seymour Allward. From the Vimy ridge we now travelled to the infamous battlefield of the Somme and visited two emotional sites associated with the Battle. First we visited Newfoundland Park, where the group again split into two, one led by Mr Savill and other by Mr Nash. We learnt how the Newfoundland Regiment and the British regiments that had left the trenches in this sector (the remains of which can still be seen) earlier in the day had been decimated, and one of the groups learnt about the struggle of the young Newfoundland soldier Ginger Byrne to make it back to the Allied trenches. We also saw the German line, and learnt how ineffective the British barrage had been in destroying the substantial German defence before the attack. Many were staggered to learn that after five months of fighting the front line here had only moved tens of meters, rather than the miles intended in the first few days. We next visited Thiepval, where 73,000 British and South African soldiers who died on the first day of the Somme between July 1916 and 20 March 1918 and have no known grave are commemorated. Here we learnt about the terrible casualties suffered by the British on the first day of the Somme at Thiepval, and as is traditional we found the names of the sixteen Old Berkhamstedians commemorated on the memorial. This was followed by a moving service in which the name of an Old Berkhamstedian killed in the First World Ware was read by each pupil, Mr Pett read a moving poem and a wreath from the School was laid by two students on the Altar of Sacrifice. A visit was also made to the huge Hawthorn Ridge Crater, created by a massive underground mine blown before the attack on the first day of the Somme. We walked around its massive circumference and learnt how the blowing of the mine had merely alerted the Germans to the coming attack. 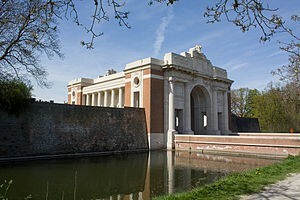 The impressive frontage of the Menin Gate memorial. The panels inside bear the names of 54,896 soldiers who died before August 1917. We finished the day by going back to Ypres and witnessing the last post at the Menin Gate memorial to the 54,900 British soldiers who left Ypres (probably via the Menin Gate) to their death and an unknown grave fighting the Germans between August 1914 and August 1917, a fitting end to our day’s experiences. After such a moving day we all relaxed with a visit to a bowling alley. On our last day we left the hostel at Kemmel and then went to visit the City of Ypres, where much Belgian chocolate was bought and some consumed! Sitting outside at one of the Cafés on the square was also a favourite activity. From here we travelled to Sanctuary Wood near Ypres city, where we visited the almost intact trenches from the First World War, which have been preserved by a local family since 1918. Here we walked through the trenches and a preserved underground tunnel leading from one trench to another. We also saw shell holes, craters and smashed trees from the War. The museum at the site, with its pictures, artefacts and 3D pictures of the War was also fascinating. We ended our visit with a visit to Essex Farm Casualty station, again near Ypres City, where the bunkers of the station can be seen, where the Canadian Medical Officer wrote the moving war poem In Flanders Fields, which was read to the group by Mr Pett. The poem was written to commemorate the death of one of McCrae’s friends at Ypres in 1915. We also saw at Essex Farm the tragic grave of a 15-year-old British boy soldier which was a moving end to a trip which had affected all. Thanks are due to Mr Savill, Miss Kielty, Mr Pett, Mr Jones, Mr and Mrs Winslett and also to the students for their interest and sensitivity.